We love to read. Lurve. We think reading is absolutely essential not only for a good education, but for a great imagination. Books teach, but they also transport and transform. This awesome organization has combined two of our favorite things - books and giving. On the We Give Books website, choose the charity you want to support. These are great non-profit organizations serving young people across the globe. 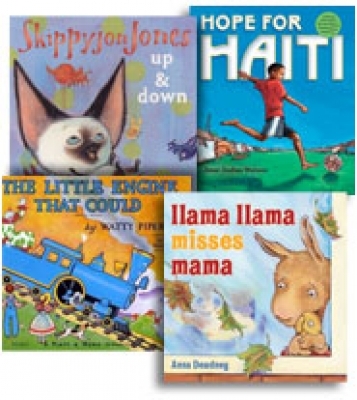 This month, for example, you can donate books to Read for Central America, Todos a Leer, Room to Read, and Out of the Blocks. Then choose the books you want to read from the growing library of great children's books. All of the books available for online reading are children's picture books appropriate for children through age ten. There is a mix of fiction and nonfiction, a range of authors, and an equal balance between read-alouds and books for independent readers. They add new books every month, and have special seasonal offerings. For each book you read online, We Give Books will donate a book to the literacy group you chose. You can also change the organization you want to support with each book, if you want. What a great tool for reading with your kids and for teaching them about charity at the same time! The more you read, the more they give. It's that easy! Our mission remains the same...to make it easy to do good. We will suggest charities that we love, and we'll guide you to make ethical shopping choices. Our ultimate goal is to get you to make one donation in lieu of a gift or to buy one socially responsible product for someone in your life. Hopefully when you see how easy it is and the good that you can do, giving and shopping ethically will become a habit and, eventually, a passion. We're gonna' change what it means to be a goodiegoodie! We also value discussion and suggestions, so if you have a charity or a brand that you love and want us to feature on goodiegoodie, we'd love to hear from you. There are a frillion ways to contact us, so go for it. And while you are at it, follow us on Twitter and Facebook for regular updates and share share share! Thank you! You're gorgeous! We love you!